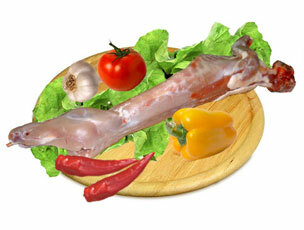 Rabbit meat is classified as non white meat, no peculiar smell, and the carcasses have a full, dense muscles with little involvement of intramuscular fat and mi�dzymi�niowego. 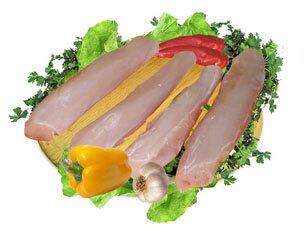 Characterized by great flavor and high nutritional qualities. 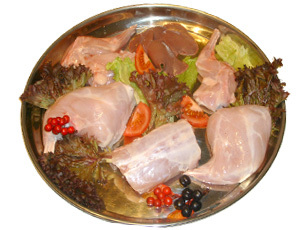 Meat is one of the most important components of the human diet, because it allows the provision of adequate quantities of essential nutrients, especially amino acids, which are delivered to the body only in the form of animal protein, and without them it can not normally develop and function. These include amino acids: valine, leucine, isoleucine, phenylalanine, tryptophan, lysine, threonine and methionine. In comparison with other species of meat animals, carcasses of rabbits contain more nutritional protein (19-25g) and other nutrients and less water, and saturated fatty acids. Hence, their high biological value. The fat content is low (around 3%), and any deviations are dependent on animal age and diet. 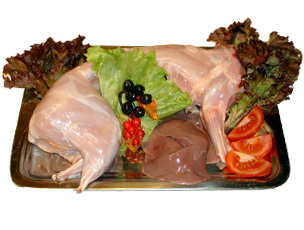 Rabbit meat contains relatively large proportion of unsaturated fatty acids, which are more easily assimilated by the body than saturated fatty acids. Cholesterol is low, about 35 - 40 mg, which is important mainly in the nutrition of people with cardiovascular disease, suffering from a flaw in protein, and diabetic patients. In addition, characterized by a high content of microelements (iron salts, 2.9 mg/100g meat 13mg/100g calcium, magnesium 21mg/100g, 200mg/100g potassium, zinc, manganese 0.51 mg/100g and 0.021 mg/100g) and vitamins, mainly from the group B (nearly twice higher than in poultry meat). 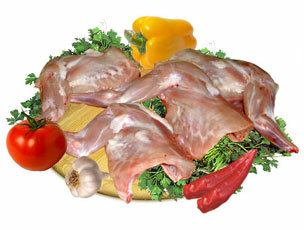 Comparison of protein, minerals and cholesterol in meat of various species of animals are shown in the table.